the famous Silent Valley National Park in Kerala's Palakkad district is under threat from another proposed hydroelectric project. The Rs 450-crore, 70-mega watt Pathrakkadavu Power Project on Kunti river would be sited just 200 metres away from the boundary of the park. The project, proposed by the Kerala State Electricity Board (kseb), is expected to become operational by 2012. Experts fear it might submerge large portions of one of the last representative tracts of virgin tropical evergreen forests in India. Earlier, in the 1970s, another proposed hydroelectric project in the area had triggered a fierce environmental debate. The Kerala government created the national park in December 1980, which excluded the proposed project site from the area. In November 1983, the hydroelectric project was finally shelved and, in 1984, the Union government also declared Silent Valley a national park. On May 21 this year, chaos reigned at the first public hearing on the Pathrakkadavu project. Scientists and environmentalists were allegedly kept out of the hearing at the behest of the 10-member public hearing committee, headed by Paul Thachil, chairperson, Kerala State Pollution Control Board. Agriculturalists and local residents of surrounding villages were also missing. The crowd of 150-200 gathered on the occasion reportedly consisted largely of people collected by kseb. Environmentalists complain that the environmental impact assessment (eia) of the project was conducted by a little-known Thiruvananthapuram-based private company, Environmental Resources Research Centre. Besides, the government didn't bother to present the eia report at the public hearing. It is feared that the proposed project would adversely affect the biodiversity of the area. The park is the habitat of the highly endangered lion-tailed macaque and an important nesting site of the Malabar whistling thrush. 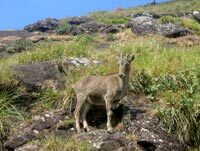 A healthy population of the Nilgiri tahr is also recorded from Kunti river's dam site. V S Vijayan, director, Salim Ali Centre for Ornithology and Natural History, Coimbatore, suggests: "A proper and fresh eia should be conducted by a competent agency. This is a very rich area in terms of biodiversity. The eia never covered the environmental costs -- the cost of habitat loss, species loss and ecosystem service loss." S Sanker, scientist and environmental expert, Kerala Forest Research Institute, Trichur, concurs: "The Kunti is the only untamed, free flowing tributary of the Bharathapuzha. It should be left alone to save the Bharathapuzha basin." For its part, kseb defends its moves. "This is not a rare ecological area and the hydel potential of Kunti river needs to be tapped. Hydel power is still the cheapest. Why should we, therefore, not look for more projects in the state?" says the board's environmental expert, Ramesh Babu.